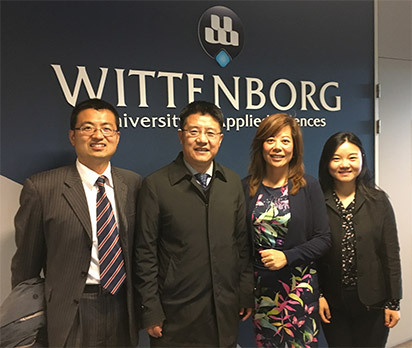 A delegation of the Chinese embassy in the Netherlands recently visited Wittenborg University of Applied Sciences where they met with Wittenborg CEO, Maggie Feng, to discuss among other things collaboration with other institutes of higher education in China. “Wittenborg is actively seeking partnerships in China,” Feng said. It wants to establish a 2 +2 degree programme in the next two years, whereby students study for two years at Wittenborg and two years at a Chinese partner university. Preparation towards this goal started a year ago, and as Feng said, it is important to find the right match for Wittenborg in China, so certain requirements have to be met. The delegation was made up of Mr Qingyu Meng, Education Attaché of the Chinese embassy in the Netherlands, and Mr Michael Wang, Second Secretary of the embassy’s Education Section. The meeting was facilitated by Simon Boon, Wittenborg ambassador, who brought the visitors from The Hague to Apeldoorn. Feng also briefed the visitors on the state of Dutch private higher education, since Wittenborg is a private institute. Also discussed was how applied sciences and professional education can be promoted in middle and higher education in China.